So literally Jidokwan is the school of wisdom. Sometimes called the Wisdom School of Taekwondo. The Jidokwan school symbol is the double red circle that looks like a red snowman. It depicts the early kicking target that rolls to the floor and bounces back after each strike. The philosophy here is to train with perseverance - Never give up - Never quit - Get knocked down nine times, get up ten! The symbol of Jidokwan is made up of three main parts. In the symbol, each of the three circles make within themselves a whole, with no beginning or end. Each of these symbolic circles represents different aspects to us as students of Jidokwan. The large outer circle represents the universe holding inside all we know and all we need around us within its mighty aspect. The larger circle inside represents our earth. The smaller circle represents the life on earth. When all three circles are placed together we see contact, one with the other. The outer eight pedals are the Buddhist lotus flower. 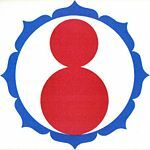 There are eight pedals that represent the Eight Fold Path. The Eight Fold Path is the fourth of the Four Noble Truths, the core of what the Buddha taught in order to relieve suffering by the destruction of ignorance (internal obstacles). The eight outer pedals are called the "Palsungdo," or in English, Eight Sacred Ways. The colors of red, gold and blue are each significant to the symbology of the Jidokwan emblem. Red is the color of energy, power, courage and attention. Gold is for spirituality and freedom. Blue is for peace, calm and friendship. Each of the eight lotus leaves which surround the Otugi figure in the Jidokwan logo represents one of the Eight Solemn Ways defined below. This lotus symbol is many thousands of years old and traces back to early symbols found in Northern India. It was later adapted by Buddhist artisans and holds the meaning of the unfolding or enlightened mind and it matches the Wheel of Life that represents the Buddha's discourse at the river Benares in India where he spelled out the Four Noble Truths, of which the Eight Solemn Ways (aka Eight Fold Path) is the forth of those truths. The Eight Fold Path has three catagories and they are Ethical, Mental and Intellectual Discipline. Tibetan 8 leaf Lotus diagram in center of tantric Mandala. Again, the same pattern as Jidokwan lotus. Ethical Discipline ( Sila) The voluntary control and direction of one's communications, actions, and contributions. Working toward moral development of one's self, for the benefit of all beings. Right Speech ( Samma Vaca ) Practice being true and courteous in all communications. Aim to promote peace, harmony, and unity. If one has nothing of value to say, one should keep a dignified silence. Practice being considerate in listening, become a student of life. Do not however, waste your consideration and time listening to inappropriate or negative communications. Right Action ( Samma Kammo ) Arises from a clear mind state which must begin with basic wholesome conduct, that helps others and ourselves by our actions, to live a peaceful and prosperous life. Most of all, one must have in mind that proper motive for doing so, for the motive is more important than the deed. Refrain from destructive behavior such as killing, stealing, abuse, truthlessness, intoxication, unruliness, etc. Right Livelihood ( Samma Ajivo ) Participate in a trade, occupation, profession, organization, or group which is compatible with Correct Action, so that one's efforts are contribution to the greater good. Mental Discipline ( Samadhi ) To bring about in the mind, orderliness and efficiency to it's process, by rigorous training and habitually thinking of the positive good. 1. Prevent wrong and unwholesome states of mind fromr arising. 2. To remove all wrong and unwholesome states of mind that already exist. 3. To develop and perfect the good and wholesome states of mind that already exist. 4. To acquire still more good and wholesome states of mind unceasingly. Right Awareness ( Samma Sati ) The path of mental liberation, the breaking of the bonds of ignorance, and the striving for happiness. Not dwelling in the past, study the world and aim to live here and now with our mind and body. The preset offers the greatest opportunities. All that we are is the result of all that we have thought, been and done. Each of us in this moment, whether consciously or unconsciously, is determining our future. Right Concentration ( Samma Samadhi ) Decide to be in charge of ones thoughts. Do not let distraction take charge. Focus the mind like a laser beam to a single subject at hand, to the exclusion of all else, until the mind becomes that which is ponders upon, to gain a full comprehension of the subject. A complete unification in which subject and object become one. Intellectual Discipline ( Panna ) To exercise the action of applying the power of the mind by which one knows or understands, in distinction from that by which one feels and that by which one wills. Right Thought ( Samma Sankappo ) We will become what we think. Occupy one's thoughts with subject matter that will enhance the lives of all beings, including oneself. Work to uncover and resolve unrecognized emotional obstructions and egocentric values. Observe that we do not always think and act with clarity and logic. Emotional obstructions can control the direction of our reasoning, preventing reasoning from moving beyond a familiar fixed point. Ultimately one must eliminate the tension and anxieties with the proper motive. Right Understanding ( Samma Ditthi ) Strive for an intellectual grasp of the truth. The ultimate reality is only visible to those who attain the highest wisdom. Observe the true nature of yourself and all things, without labels and names. Only when the mind is in a clear state, a state brought about by the development of freedom from the tyranny of the selfishness and self-destruction, is this deep, penetrating insight possible.